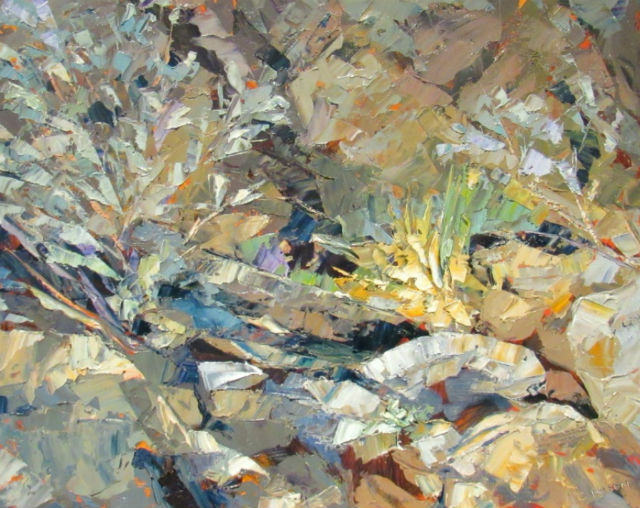 Plein air “Romance in the Desert” by Cynthia Rosen. “Plein Air” means fresh air — think outdoors — in French, and many painters feel inspired when working outdoors in natural light surrounded by the splendors of nature. The Borrego Art Institute is currently hosting its 12th annual “Plein Air Invitational,” an exhibit that showcases the beauty of the San Diego County desert. The 15 plein air artists represented excel at capturing nature’s glory, each one in a distinct way. They paint in watercolors, oil and pastels; they hail from different places, including California, Arizona, New Mexico, Utah, Nevada, Colorado and even South Africa. But the 147 paintings on display were all completed in and around Borrego Springs between March 4 and March 9. ”In the Borrego desert, they each found a personal view they wished to translate into a painting, and the starkness of desert light and shadow, plus the vegetation adapted to dry conditions, told a story the artists then tried to convey,” explained exhibit curator Shannon O’Dunn. 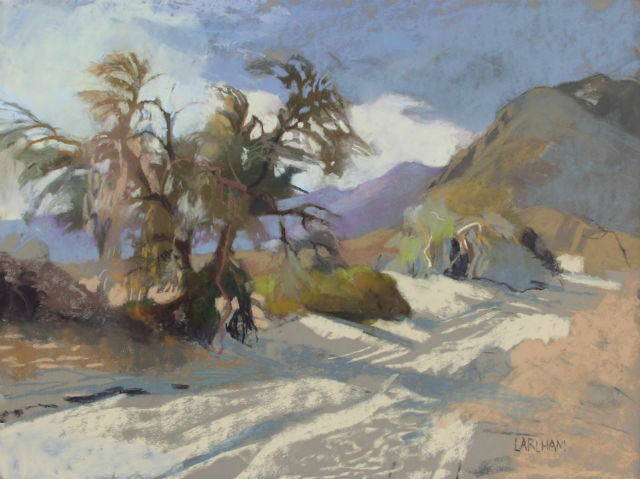 South African artist Margaret Larlham won best in show at the March 10 gala for “Notations: Palo Verde Wash.” Larlham is from South Africa, but has lived in San Diego since 1986 and is a retired San Diego State University professor. Colorado artist Jim Wodark, who now lives in Orange County, won second place, and Greg La Rock third place. The institute’s gallery is open Tuesday through Sunday from 10 a.m. to 5 p.m. The plein air exhibition runs through April 1.